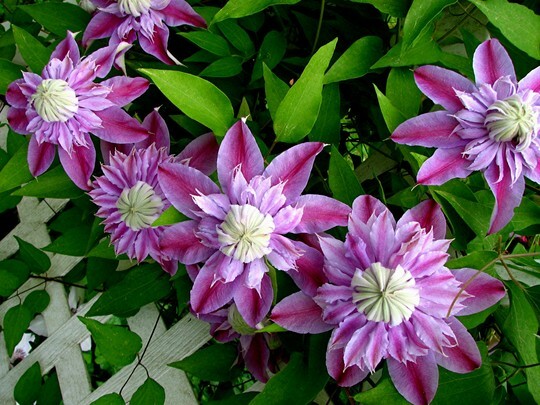 oh that is gorgeous, Im a big clematis fan, do you know the name of that one? The flowers are awesome - how lovely! Lost this one, this winter, mine was called Josephine. Unfortunately it was a £14 one, usually the way. I can sure see why you love this one so much. ENJOY ! Thanks everybody, it's so colorful the first week it's in bloom, just had to share this photo when it was at it's peak. As the blooms age, they fade to a light lavender. Like Dotty said, it's called Josephine, looks like they sell it there Jacque, so glad it didn't cost that much over here or I wouldn't have been brave enough to buy it . Clematis's can be a fickle bunch, depending on the variety. This is such an exciting form and color. I'm still waiting to see if mine the moose munched is going to come through. Late spring. The columbine is just starting to poke through. So glad to hear the first plants are starting to show themselves GT. That's always a very exciting time of the year for me ! Hope your vine bounces back, fingers-crossed ! One of my hair clients just bought this one for her garden in honor of her mother who passed away last year. Her mother's name was Josephine. It sure is a real beauty. Thanks Louise, glad you liked it. What a touching story Mike, I hope and pray it does great for her. Thanks Angie, it's the only vine I've bought that looks better in person than it did in the sales catalog...! I count myself very lucky that this one likes where I put it. Ohh so beautiful, love the colours. Nice photo! Another great success story for you, Flcrazy! wish I had better luck with clemmies...I must admit "Josephine" is tempting me to try it...I saw it yesterday at HomeDeep.... I found my New Dawn and I could not pass that up...I'm losing the battle not to get carried away with buying plants that I'll have to move!! Thanks for dropping in and visiting my posts Avis. I have to admit that this clematis owns a soft spot in my heart...lol. I'm jealous, yours is gorgeous. Mine only got one flower this year and the plant itself looks sad. Any helpful hints Flcrazy? I really don't have a clue either Tasteyg. I have a love hate relationship with clematis myself...lol They don't all seem to like the same conditions. I just plant them and hope for the best. I was just very lucky in placing this one I guess. I was complaining about my clems to another goyer and he suggested a dose of fish emulsion fertilizer....says they're heavy feeders. You must have been getting your mulch from your dad's farm aye, flcrazy? Apparently the source of this advice was a UK member...so round and round we go! Long story short...I tried it on my balky clems and they are doing much better. worth a try, do you think? Most certainly is Lori, thanks for the info. Tasteyg and I will have to give it a try ! It's beautiful, I've always liked this variety. I bought my late mother this clematis for her birthday along with an arch and Mrs. N. Thompson to go up the other side. Unfortunately, Mrs Thompson went the distance, but Josephine survived. I've now got the arch (see my pictures) and I've transplanted Josephine to her new home, hopefully she won't take umbrage at being shifted when just about to start this years growth! My youngest daughters name is Josephine which is why I bought the plant in the first place. there are so many people on here who love clems... I have to send you a pic of the clem you sent me... no blossom yet, but that doesn't happen til late summer, right? That's right sweetie...;-). So glad to hear it survived your Winter ! The blooms are small but the smell absolutely delightrful. I hope all is well in your part of the world ! all things considered, things are going pretty good... I kept the clem inside all winter... it is an amazing plant because it survived our winter indoors!! Hahaa...aaaa, you're the woman Lori... ! This is a stunning clematis. I have been reading all the above comments & I'm so glad I am not the only one who has problems with them. I planted three when I lived in England, over different times. All three withered within weeks & I was soooooo careful with the second two, after losing the first. I don't know what I was doing wrong .... it might have been the soil I guess, as all three were planted in the same spot to climb up a trellis. That was over 12 years ago, & I have never attempted to grow one again. But living back in New Zealand now, & with much milder winters in the area I reside in, so I am going to give them another go! This very weekend I am going to find one to climb along part of the wall in my new side garden bed. Fingers crossed it won't wilt on me again, like the others did. I love this one too. Last year it flowered i the Autumn which I thought was odd. Its just come back now. Any idea how to encourage it to do this again this year? This photo is of species Clematis 'Josephine'.